This month we will take a closer look at Tomcar Australia — the Australian manufacturer of the world-renowned premium all-terrain Tomcar vehicle. 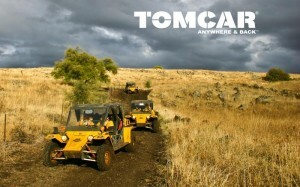 The commercial off-road Tomcar vehicle is made in Australia, in a state of the art factory in Melbourne. The Tomcar story begins in 1967 when a soldier who was also a highly skilled mechanic managed to cobble together two working vehicles from the wreckage of six destroyed Jeeps that were unsuccessfully parachuted into enemy territory. Today, the Tomcar has evolved into the strongest vehicle in its class that does not only require low maintenance, but it’s also tough, thanks to its fully welded steel safety cell that is fully ROPS to ISO 3471 standard. All Tomcars are built to global automotive standards and come with a level of manufacturing and quality that is unsurpassed in the off-road vehicle industry. All Tomcars have interchangeable parts and all wear components are adjustable to compensate for wear, thus extending the intervals between replacements and reducing the vehicles’ running costs. In an era of automation and robotics, Aussie-made Tomcars really stand out by being completely hand-made. The company uses a wide range of special jigs and tools to ensure accuracy during each precision build and does not rely on robots or automation. The company outsources its production to a close strategic partner and investor in the business, MTM. MTM has a high-tech manufacturing plant in Melbourne with over 200 employees where it manufactures the Tomcar to the company’s specifications. MTM also manufactures other high-quality auto products. “We’ve moved into an era of designing and managing the factors of production, rather than being them. Which is why we outsource our production,” the company CEO and Co-Founder David Brim states. The company believes that its competitive edge within the manufacturing sector is the outsourced manufacturing. The Tomcar’s unique specifications and capabilities have met the needs of operators in the mining, agribusiness, recreation and tourism industries as well as military and border patrol agencies. As a product of over two decades of engineering expertise, the Tomcar is truly the toughest off-road vehicle out there that is built to last.